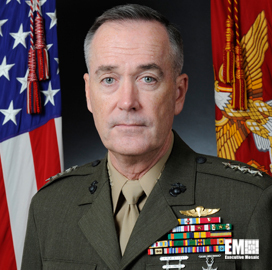 Marine Corps Gen. Joseph Dunford received Senate confirmation Wednesday to become the next chairman of the Joint Chiefs of Staff, Defense News reported Wednesday. Leo Shane III writes he will succeed the retiring Army Gen. Martin Dempsey in September, according to the report. The 38-year Marine Corps veteran has served as commandant of the service branch since October 2014. Dunford was commander of U.S. Forces Afghanistan between February 2013 and August 2014 and commanded the 5th Marine Regiment during the 2003 Iraq war. Tags executive moves featured govcon Joint Chiefs of Staff Joseph Dunford Martin Dempsey Senate U.S. Marine Corps.